The Microsoft Surface Pro (2017) is 50% off at Office Depot and Office Max. Normally priced at $999, you can pick up the Windows 10 Pro powered slate for $499.99. This is the model powered by the 7th generation Intel Core i5 processor, and is equipped with 4GB of RAM and 128GB of native storage. The 12.3-inch display carries a 2736 x 1824 resolution, and the camera combo from back to front weighs in at 8MP and 5MP, respectively. Accessories like the Surface Pen and the Type Cover are extra. 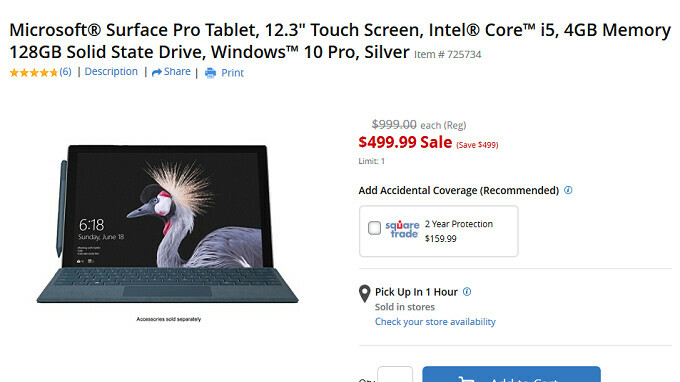 This sale could be a random one, or it could be a sign that a new Surface Pro model is on the way and Office Depot and Office Max are looking to clear out the inventory in their warehouses. On the other hand, Microsoft waited two years (from 2015 to 2017) for the last refresh, so we might have to wait until next year to see a new Surface Pro tablet. Recently, this very model was on sale at the Microsoft Store for $799, and the device is now out of stock. If 20% off can generate a sell out, imagine what 50% off will do. So if you are interested in this deal, we would suggest that you do not procrastinate. You can get more information by clicking on the sourcelink below. If you price poop at half the msrp, it’s still just poop. You can hardly do anything with 8GB RAM on a PC these days, I can’t imagine what people are doing with a measly 4GB RAM. BS! You don't need 8GB of RAM for normal daily tasks. If you do some more heavy stuff then yes. But for people who only browse or watch YouTube etc 4GB is enough. Unless you have hundreds of crappy Chrome browsers open, everyone knows that Chrome is the worst RAM manage wise. Btw the Surface Pro's are the best no crappy iPad for example comes even near it! I am a developer doing really heavy stuff and 4GB of RAM is more than enough for most tasks. You only need more RAM for video editing and games (and developing AI stuff but even 8GB is not enough in that case).